I know we (ok, I) have been doing a terrible job on keeping this updated! To be honest it gets the least attention because of well....life, work, facebook and my photography blog. But life is good. I am so happy that fall is in full swing, it is definitely one of my favorite seasons. The cool temps, beautiful colors, and of course all the fun fall activities :: apple picking, football games, pumpkin patches, baking (for some reason this is the time of the year I usually start up again! )......we have been having a blast! "God knows I already have a sister, and he knows I don't need another!" She is a character, always bringing smiles to our faces! Skylar has started school. She is attending the local Christian school and LOVES it. She is making tons of new friends and getting a great foundation. Chris and I were so happy to be able to have her attend there! She just wishes she could go every day! She is turning into such a little lady! She amazes me everyday with her smarts. Ari is doing her best to keep up with her big sister! She is a sweet mama's girl with an attitude bigger than most adults (Chris jokes she gets it from Haley, Haley however doesn't find it that funny). She really looks up to her big sis and enjoys any and all attention Sky gives her! She is such a wonderful little girl with serious determination. Chris is enjoying his new (well 4mos new) job at Prestige Imports as a service writer. It is keeping him busy. In addition to that he is still finding a little time to buy/sell cars at the auctions. He is very much looking forward to the upcoming ski season....he is going to have his hands full though, he is going to have to work with both girls on the hill this year since I won't be able to ski this season! I have been staying more than busy being home with the girls and continuing to grow my photography business. I was blest this year with a busy schedule and AMAZING clients. 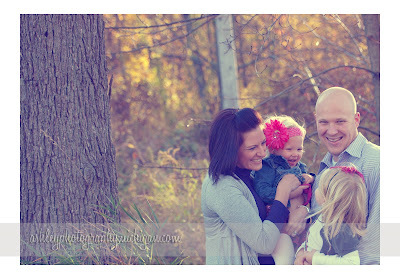 My wedding season is coming to a close but I am staying busy through the fall with family sessions. And I am almost booked for next summer, it is truly amazing to see your passion and dreams become reality! hope everyone is enjoying their fall season....and only 68 days till Christmas!! !